Maria Koleva is just 22 years old. She is born in one of the most beautiful spots in Bulgaria - town of Karlovo, located in the amazing Rose Valley. 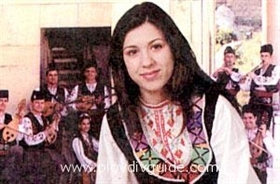 She has published overseas her first album of BG folklore music, called "Right from the Source".The CD presents Thracian area folklore music and is extremely popular all over the States.